And so, for an audience to laugh, first they have to feel comfortable — they have to believe in the performer’s swagger and their material. It’s one of the reasons comics use such violent language to describe their performance: If it goes well, they’ll declare, “I killed out there,” whereas if it’s a tough room, you might hear them say, “I bombed.” The nakedness of a comic alone on stage is an inherently terrifying sight, and the more they can remove that anxiety, the better it is for them and us. For most of his life, Patton Oswalt has been doing stand-up, but his newest special is his oddest, for obvious reasons. 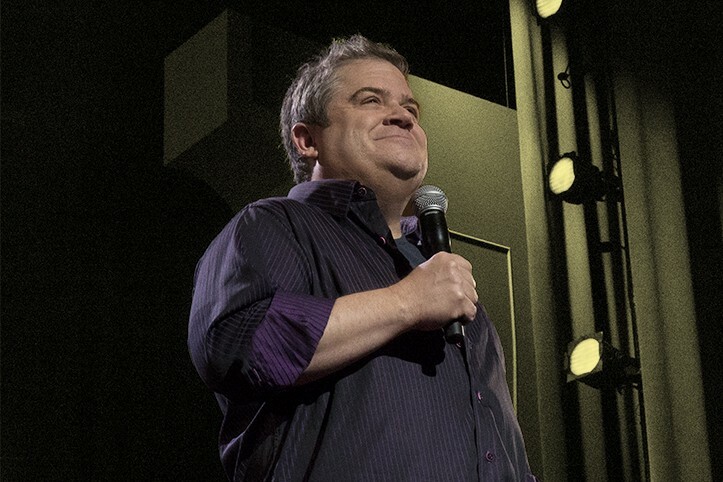 In interviews, Oswalt has said that he named his Netflix special Annihilation in reference to the common refrain of comedians “killing,” but I suspect the title also alludes to the trauma he experienced in April 2016 when his wife of 10 years, writer Michelle McNamara, died in her sleep. If stand-up sets are meant to exude confidence and comic mastery, then Annihilation is an acknowledgment that sometimes life strips away the illusion of control. Fear and pain dominate Oswalt’s special. He and we know what’s coming — and what he’s eventually going to talk about — and there’s nothing any of us can do to stop it. We just have to get through it together. Filmed in Chicago in June, Annihilation acknowledges the uncertainty hanging in the air from the start, as we see Oswalt walk down a lonely hallway from his dressing room before hesitantly going on stage once the theater announcer introduces him. Is he going to perform or face a firing squad? “Until I stepped out onstage and started talking for like 10 minutes, I honestly didn’t know if I could do this,” Oswalt recently admitted to Vulture about the one-hour special, and he’s not exaggerating. When the crowd greets him warmly with a standing ovation, there’s a look of appreciation but also reluctance across his face — almost as if he’s not sure he’s ready for this. Oswalt then proceeds to dive into a series of jokes about how Trump’s inauguration ruined his plans to get fit in 2017 and why the country wasn’t ready for a female president after electing a black man. These bits are solidly executed, and the crowd laughs at all the right spots, but there’s an unmistakable cloud hanging over the proceedings. Nobody in that Chicago crowd, nor anybody watching on Netflix, is tuning in to hear what Oswalt thinks of our terrible year. We want to know about his specifically terrible year, which was even worse than ours. Annihilation isn’t the first time that a stand-up film’s energy was partly derived from our and the comic’s acknowledgment of offstage traumas. 1982’s Richard Pryor: Live on the Sunset Strip was his first special after he made headlines by setting himself on fire while freebasing cocaine. Sunset Strip captured Pryor’s anxious buildup to finally talking about what everyone at the show was there to hear. Similarly, there’s an air of anticipation in Annihilation’s first half, as Oswalt doesn’t so much deliver punchlines as he seems to be making comedic small talk, flitting around what’s really troubling him until he feels comfortable enough to go there. But even if Annihilation’s early material isn’t among Oswalt’s best, there’s a poignancy to his hemming and hawing. At one point, he tells a story of something that he witnessed in 2000 — a fight that broke out on the Sunset Strip — that’s meant to suggest how un-macho he is. But while the anecdote is amusing, it’s also sweetly pointless. And what makes it so touching is that it’s clear he’s telling us this story so that he can delay as long as possible what he fears telling us. Throughout his observations, Oswalt chuckles and occasionally cracks a smile, but I couldn’t get past the overwhelming sadness on his face — the perpetual look that suggested this was all still too fresh and he wasn’t quite ready to polish this material to where it could be great. Tears are probably more likely to be triggered than laughs in Annihilation, but after years as one of alt-comedy’s most beloved stand-ups, Oswalt has earned the right to just talk to his audience, unburdening himself of an emotional weight he doesn’t expect to let go of any time soon. There are jokes in Annihilation, but not a ton, with the promise that more will come later when Oswalt has more perspective on the tragedy he’s experienced. About 10 years later, Annihilation is that funeral, and it speaks to Oswalt’s talent and humanity that he’s confident enough to keep building those quiet minutes, unconcerned if a random jerk won’t be able to handle a thoughtful silence. That’s the kind of courage that outweighs any fear. So in Annihilation, he doesn’t kill, but he does survive.